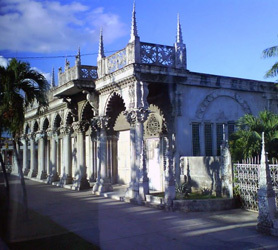 A unique architectural building located in the heart of the city of Santa Clara (276 kilometres east of Havana) which opened on September 8th of 1885 and was declared a National Monument of Cuba in 1981. The building was constructed thanks to the generosity of Marta Abreu de Estévez, a member of an illustrious and wealthy family of the area, who financed it’s building and later on donated it to the city so that part of its income would be destined to the poor. For years famous actors and actresses have performed on its stage, such as Enrico Caruso, Libertad Lamarque, Jorge Negrete, Rosita Fornés, Lola Flores, Chucho Valdés, Alicia Alonso and the Cuban National Ballet. Today it is still open to the public as a theatre that offers the visitor the possibility of being transported back in time.